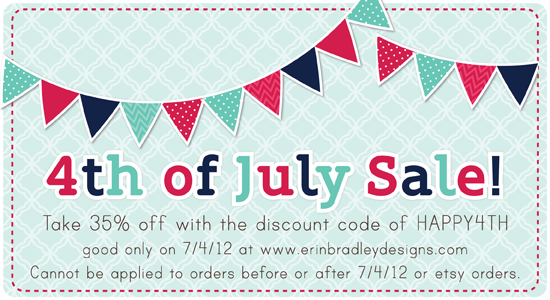 Erin Bradley Designs: Happy 4th of July...Let's Celebrate with a Sale! Happy 4th of July...Let's Celebrate with a Sale! Happy 4th of July! To celebrate, I'm having a 35% off sale at Erin Bradley Designs, good for today only! This discount can also be applied to the "no credit required" commercial use sets. Use the coupon code of HAPPY4TH at the checkout and hit the "recalculate" button to apply it to your order. Please note this is good only at www.erinbradleydesigns.com and the discount must be used at the time of purchase. It is good only for orders on 7/4/12 and cannot be applied to orders before or after 7/4/12.